The world-first Music, Mind & Wellbeing initiative links neuroscience with music and social wellbeing through a unique set of collaborations spanning music, science, health, education, and industry. Meet the team behind Music, Mind and Wellbeing. Explore our graduate students research topics. Our Vision is to foster participation in music across the lifespan, so that the benefits of music can be shared by all. Music engages our emotions, imagination, and intelligence in creative endeavours that promote personal wellbeing and social cohesion. 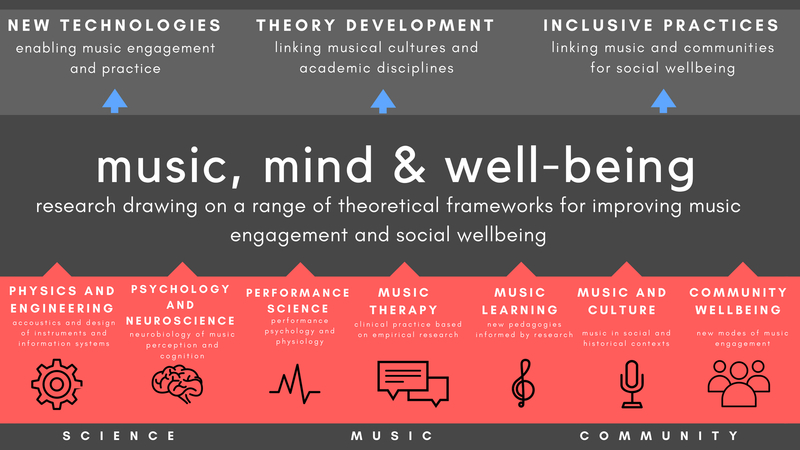 As shown in the diagram below, we draw on a breadth of interdisciplinary expertise to generate new knowledge about music and its potential to enhance the health and wellbeing of individuals and communities. Research participants sought! Dr Amanda Krause is seeking participants for her research into the impact of radio on the lives of older listeners in Australia. How well can you sing Happy Birthday? And if the answer is 'not very well', then don't feel too bad. Singing helps calm both the baby and the parent, experts say, and creates a bedtime ritual to signal a transition from the day’s activities. Professor Sarah Wilson was interviewed by Val McFarlane for Pursuit on congenital amusia for a story titled Tone Deaf? Why you can still hit the right notes. ABC's Catalyst aired their episode, It's a Twin Thing, on October 31, 2017. MMW's Professor Sarah Wilson and Yi Ting Tan discussed how the findings from their twin study suggest that there may be an underlying genetic basis to musical ability. We welcome your engagement with Music, Mind and Well-being. MMW hosts free Public Lectures in the benefits of music for mind and wellbeing, as well as co-hosting seminars in association with the Australian Music and Psychology Society and the Melbourne Recital Centre’s Music on the Mind series. To solve real-world problems, we need to partner with the best of all disciplines, industry and community organisations. Sign up to our newsletter to receive the latest in Music, Mind and Wellbeing initiatives. Find out more about our engaging public seminars and view an archive of past activities. Your support for our initiatives is invaluable. Find out how you can donate here. Enroll in one of a range of undergraduate subjects offered at the University of Melbourne. We can provide bespoke training based on the needs/interests and suggestions of training participants and partners. The founding members of MMW are all leading researchers in brain mechanisms involved in listening to and engaging in music, social factors involved in music learning and participation, the therapeutic application of music for health and wellbeing, and advanced music theory and technology. View here for a list of MMW current research projects. We are seeking study participants for a number of research projects involving music for people with dementia, twins and singing and enhancing lives through music on the radio. View here for a list of MMW research publications.